There are currently 84,728 users on this website. Would you have a significant (visual, etc.) preference for one or the other proof sets shown? I like the top one with all the coins in the proper position, not rotated like the bottom set. If you are talking about proof sets, then presentation by of the packaging, must be important. Your own personal preference becomes a very important aspect. My preference is the for the way proof coins are actually made. I prefer the older approach used by mints around the World before 1950. Then, selected dies were used and selected blanks were used, and the coins were struck at increased pressure, sometimes double struck. Now, polished blanks are used, the fields of the dies are mirror polished, and the details are etched to produce a cameo effect. I have a problem with the production of the cameo effect, because some of the fine detail is lost to produce the cameo effect. When the detail in NOT cameoed, all of the detail is retained on the coin. That is why I am personally not really happy with the modern cameo effect. I prefer the older style of proof production, where all of the design detail is retained on the proof die. A good example of the older approach to proof coin production can be found on much older proof coins, such as the proof sets produced by the British Royal Mint in 1937. 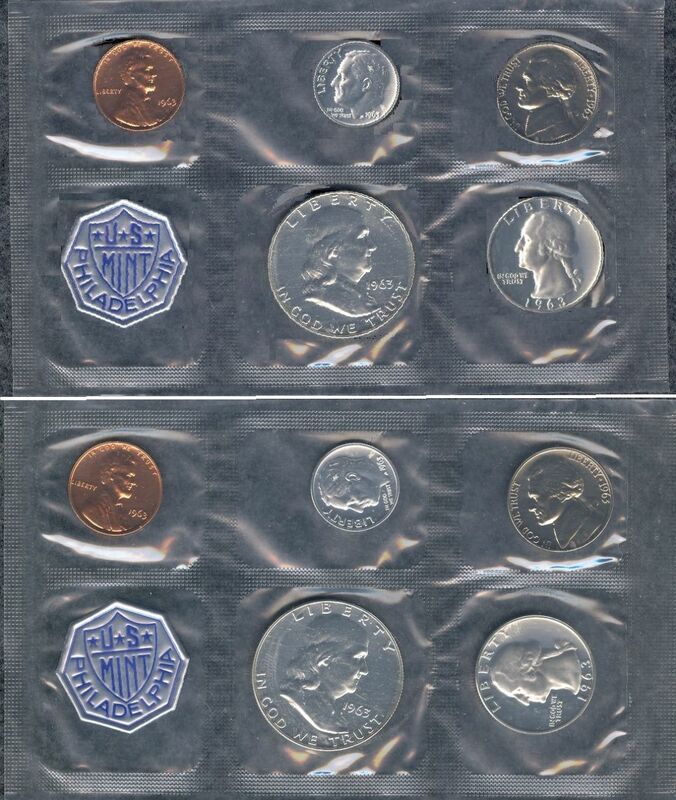 Admittedly, modern encapsulated and boxed proof coin packaging is far superior for those proof coins produced before about 1970. Modern polished field cameo proof coins seem a bit 'gimmiky' to my eye, despite their great popularity. As photographed? No, I do not see a real difference between them other than the alignment mentioned above. How did you rotate them ? I don't see any difference. No way to stop the rotation in the package, it happens over time and with multiple handling. Without seeing the reverse,I like the top one because they are properly rotated...for now . Even mounted in a Capital Plastics holder they seem to move around. No affect on the value of the set, only thing that matters is pristine coins. This is the same set, same spots on the half and the dime, the coins are just rotated. Why are we even discussing this ? 2 Tanman: Wasn't trying to fool anybody! This is obviously the same set. I've modified the image to illustrate my question/point. I personally prefer the image (hypothetical set) with all the coins in the upright position, and I was wondering if it would be worth my the time to rotate the coins in all my sets to an upright position, that is, would others see the same advantages. If you are not showing anyone else, and you're not bothered with them being rotated every which way, you shouldn't have to. Tricky. You had me going until Tanman pointed it out. My initial thought was that I had no preference. I suppose because I know that the coins' positions will not be maintained if handled and I could see no noticeable difference in the coins from set to set (I got that right!). Even some older TPG slabs allow coins to rotate, from what I understand. Rattlers? For what it is worth I would be cutting those coins out and putting them in a Dansco.